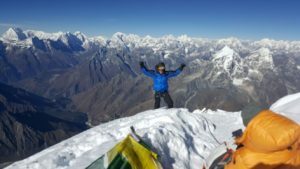 “Omg!..we had an amazing summit push with incredible weather! 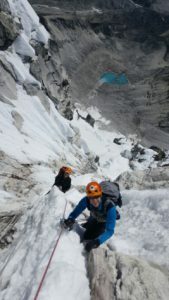 In clear sunny skies we moved thru 90% of the technical terrain climbing thru rock snow and ice. 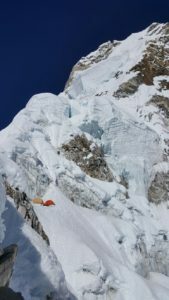 With the help of our talented sherpa climbing team we established high camp at 2.7 and had a well deserved rest. In the cold darkness the following morning, we downed some coffee and a quick hot breakfast and suited up for our final push to the summit. The route was challenging with several vertical snow and ice pitches but things eased off as we approached the final snow headwall. On the summit all members were tired and stoked on the views and the achievement. It was an incredible 360 degree view of the Himalayas! The descent was long and hard but each step brought us lower and closer to comfort of a soft bed, hot meal and booze! Interested in our international expeditions? 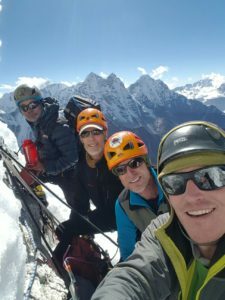 Click here to view our Ama Dablam expedition or click here to check out our website. For questions shoot us an email info@alpenglowexpeditions.com or call the office 877-873-5376.